Ever wonder what that melt-in-your mouth, chewy dough is? 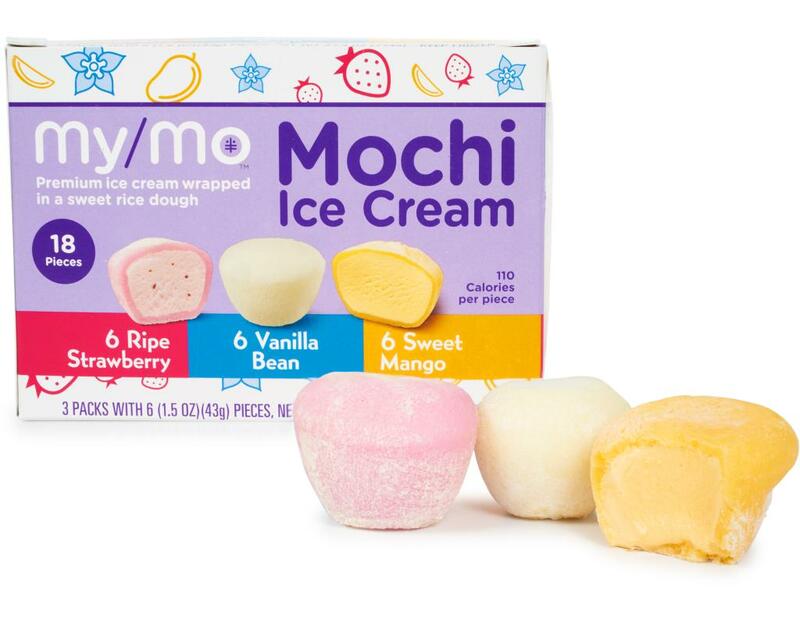 Its called Mochi! This sweet rice dough is made from the best ingredients to create that ooey-gooey texture you can’t get enough of. Once you get past the layer of sweet Mochi dough, your taste buds will be delighted by extra creamy ice cream. MyMy adds very little air into their ice cream, to boost smoothness, flavor, and create a truly premium treat. 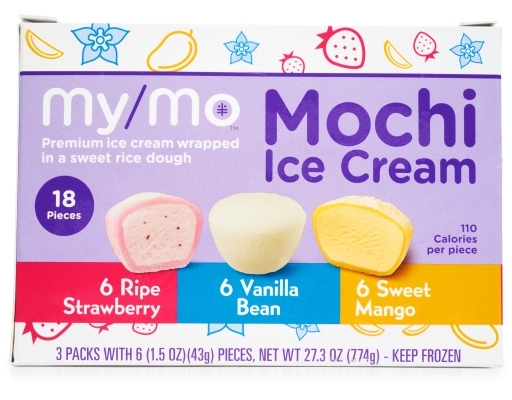 This pack contains: 6 x Ripe Strawberry, 6 x Vanilla Bean, 6 x Sweet Mango. 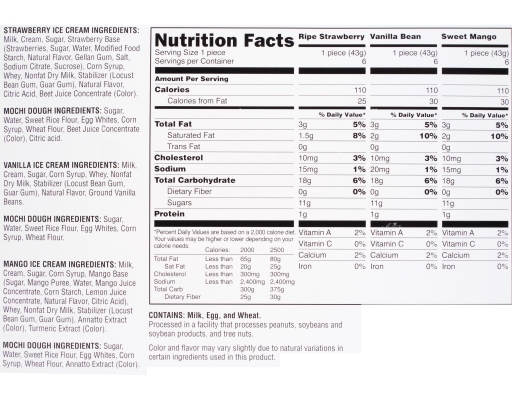 Strawberry Ice Cream: Milk, Cream, Sugar, Strawberry Base (Strawberries, Sugar, Water, Modified Food Starch, Natural Flavor, Gellan Gum, Salt, Sodium Citrate, Sucrose), Corn Syrup, Whey, Nonfat Dry Milk, Stabilizer (Locust Bean Gum, Guar Gum), Natural Flavor, Citric Acid, Beet Juice Concentrate (Color). Mochi Dough: Sugar, Water, Sweet Rice Flour, Egg Whites, Corn Syrup, Wheat Flour, Beet Juice Concentrate (Color), Citric Acid. 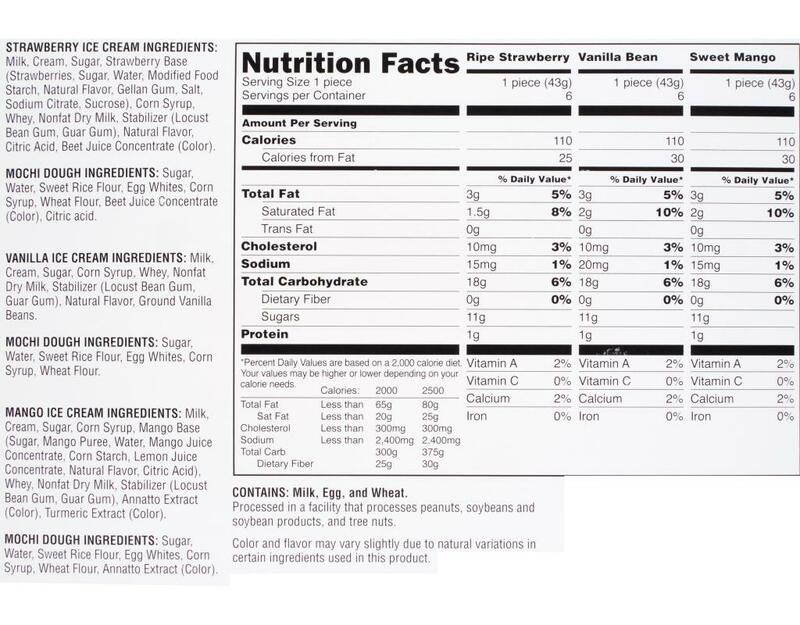 Vanilla Ice Cream: Milk, Cream, Sugar, Corn Syrup, Whey, Nonfat Dry Milk, Stabilizer (Locust Bean Gum, Guar Gum), Natural Flavor, Ground Vanilla Beans. 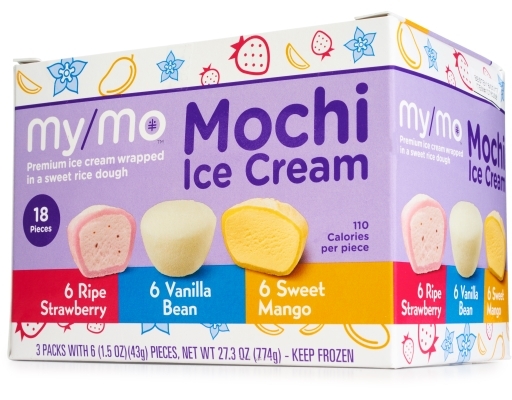 Mochi Dough: Sugar, Water, Sweet Rice Flour, Egg Whites, Corn Syrup, Wheat Flour. Mango Ice Cream: Milk, Cream, Sugar, Corn Syrup, Mango Base (Sugar, Mango Puree, Water, Mango Juice Concentrate, Corn Starch, Lemon Juice Concentrate, Natural Flavor, Citric Acid), Whey, Nonfat Dry Milk, Stabilizer (Locust Bean Gum, Guar Gum), Annatto Extract (Color), Turmeric Extract (Color). Mochi Dough: Sugar, Water, Sweet Rice Flour, Egg Whites, Corn Syrup, Wheat Flour, Annatto Extract (Color).